Geraldine Chaplin is an accomplished actress in her own right; she has starred in American, Spanish and French films, and won a Golden Globe award for her portrayal of Tonya in “Doctor Zhivago.” But she may be best known as the daughter of film legend Charlie Chaplin. In June, Geraldine Chaplin spent two weeks in Moscow, where she headed up the main jury of the 33rd Moscow International Film Festival. She spoke with Russia Beyond the Headlines’ Anna Protsenko about her career and her family legacy. Russia Beyond the Headlines: I would like to begin by asking you about your famous family but I am at a loss where to start.With your father Charlie Chaplin, the grand old man of silent film? Or your grandfather, Eugene O’Neill, winner of the Nobel Prize for literature and several Pulitzer prizes? Or your mother Oona O'Neill? 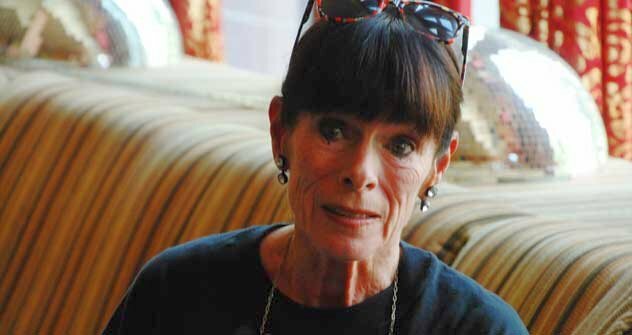 Geraldine Chaplin: I did not know my grandfather. When I grew up, I read and admired his plays. I remember watching a theatre production of his play with some friends. I was greatly impressed by it and became very emotional, explaining to my friends that grandfather had written this play about my own big, complex family. One of my friends responded: “Don’t get big-headed. Eugene O’Neill wrote this play about everyone’s family.” I think that explains why he is considered to be the father of American drama. What was the price of being Charlie Chaplin’s daughter? I am often asked this question. It was no price, I reveled in it. It meant that all doors were open for me. RBTH: How did your father work? Can you recall any domestic episode involving your father? G.C. : On the set, he was, above all, a demanding boss and not a loving parent. When he was shooting “Limelight,” he was extremely strict with everyone and was not soft on us, as his children. My brother and I were still happy, because the shooting was a pretext for not going to school. In real life, he adored attention and the public. This may be why he raised such a big family. When our family went to a restaurant, he liked to do a trick. They have a dish in Switzerland, one of his favorites, called “blue cod.” A live fish is thrown into boiling water. When it is cooked, it is put on a dish and served. When we were children, we thought we saw an expression of horror in the fish’s eyes. Father always took the dish with both hands, put his arms around it and said in a tragic trembling voice: “Emma, dear Emma, it’s you. I recognize you.” Then he sucked out the fish’s eye and said again with a sob: “Oh, my darling.” All the people in the restaurant watched, entranced by the spectacle. Another episode usually happened with the obligatory wine tasting. My father, looking very serious, watched closely how the wine was poured into the glass. He considered its color, aroma, then took a sip and savored it for a long time in his mouth. Then something incredible happened. He leaned back in his chair and spat out all the contents on the floor with an expression of extreme disgust. In an instant, with a calm and unperturbed expression on his face, father looked at the waiter like a true aristocrat and said, with dignity: “Splendid, simply wonderful.” You can imagine that we never left a restaurant without attracting people’s attention. RBTH: How did you feel working with David Lean on Doctor Zhivago? How Russian did the film turn out to be? G.C. : I became friends with David after the shooting of Zhivago. It’s hard for me to say how Russian the film is. I can say for sure that it was 100 percent a David Lean film. Just like my father used to recreate London streets for shooting in the U.S., so David built two pieces of Russia in Madrid. There were two streets: a rich one and a poor one. The country sequences were shot in the Spanish Soria. That winter, there was no snow in Spain. They were spraying marble dust on the film set and we wrapped ourselves in winter clothes and pretended to feel cold under scorching sun in temperatures of 45 degrees. We were not allowed to drink throughout the day, to prevent us from breaking into a sweat as soon as we put on winter clothes. RBTH: What is it like being an actress? How do you prepare for your roles? G.C. : I always take great pains to prepare myself. If I am to play a real person or a historical character, I try to find and read everything known about her. My husband will confirm how serious this is. He jokes that, when I play murderers, the atmosphere at home becomes tense and far from normal. RBTH: How do you feel about fame and popularity? G.C. : I feel quite relaxed about popularity. My brothers and sisters and I have been photographed from early childhood. To be a public personality is part of the actor’s career. I feel annoyed, though, that photographers today are not content with just seeing you stop and smile at them. RBTH: In the film “Charlie Chaplin,” you played your own grandmother. How does it feel playing a member of your family and an elderly woman at that? G.C. : By the time the film was shot, I was no longer young, so much as I would have liked to, I could not play any of my father’s beautiful girlfriends. I have played many middle-aged characters. RBTH: What films do you watch? What are you like as a spectator? G.C. : I am certainly a very responsive spectator; I am very emotional. I like watching films, often festival films. I seldom watch commercials. Having said that, this year my husband and I attended the first screening of the third part of “Transformers.” Now we know what our grandson is playing with all the time. RBTH: What do you think of new film technologies? G.C. : Most of my father’s films are in the silent cinema genre. He believed that sound would kill the cinema. We have seen that sound did not manage to kill the cinema. And yet, at the time, it was a new film technology. So I am not opposed to novelties. RBTH: Do you like Russian cinema? What Russian directors or actors would you like to single out? G.C. : Unfortunately, I know little about the new Russian cinema and its directors. Of course, I am familiar with the classics. Eisenstein, Pudovkin, Tarkovsky. Modern cinema? I don’t know what to say. It is not shown in Spain, where I live now. At the 33rd Moscow Festival, I met two young Russian directors, Nikolai Khomeriki and Sergei Loban. I even left my phone number for him to call me directly, not my agent, if there were a role for me in his next film. His film had a young team, with beautiful, young, pure faces. I was greatly impressed by Renata Litvinova, who played a cameo part in “Heart's Boomerang”. She inhabits space so well and sets the tempo and rhythm. Her movements are like an enchanting dance. The actress turned a brief episode into an incredible show in its own right. RBTH: What are your impressions of Russia and Moscow? Is it your first visit? G.C. : My family and I are globetrotters but it is only now that we are visiting Moscow. Russia was and remains a place that attracts. During this visit, we could not see everything we wanted. I will remember the sight of Red Square. The heart of Moscow looks truly magnificent at dawn, in the daytime and at night by the light of streetlamps. I am leaving Russia with a strong feeling that we have to come back.